Anyone who has been following the Long Earth series will be eagerly awaiting this fourth and penultimate novel in Stephen Baxter's and Terry Pratchett's series. The Long Mars was the strongest novel in the series so far and so The Long Utopia has a lot to live up to. The Long Utopia is set some time after the Long Mars and humanity continues to spread out along these new Earths.Lobsang, now old and cantankerous is living in disguise with Agnes on a far-distant world. Convinced that they have chosen such a life themselves it appears that fate may have interceded as it soon becomes clear that this world is far from ordinary. Beneath the surface lies a secret that could threaten not just that world, but all the worlds in the stepwise multiverse. 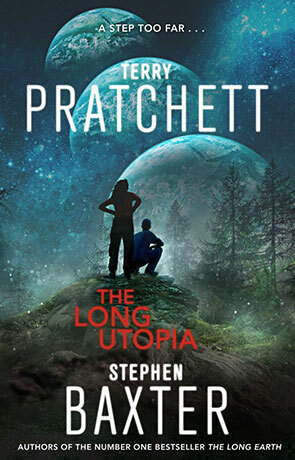 It is ineviatble that The Long Utopia will be met with bittersweet feelings, Terry Pratchett co-wrote this and the final novel in the Long Earth series with Stephen Baxter back in 2013, some time before his untimely death. It is the strongest novel in the series so far, balancing the best of both authors. The feeling of knowing that there is still new Pratchett stories to read is offset by the fact that we will not read the like again, once The Long Cosmos and The Shepherd's Crown (the final Discworld novel) is released. It's here that we can see this joint project in all it's glory. It is undoubtedly Baxter-led with his hard-scifi edge but that edge is softened in just the right places by Pratchett's unique humour and glorious wit. There's a great deal less physical travel in this book and the future and over-arcing story of these connected worlds finally takes centre stage. We also get treated to travels into the past and the book switches back and fourth between the first ever natural steppers (Joshua's ancestors) and the present. There is also a big discovery that changes the landscape in a way I didn't see coming but makes a great deal of sense. It's a big reveal that expands on the original idea in a clever manner. As a story, this book is more cohesive and more focused than the previous in the series, we've gone off the gentle track of exploration into a compelling story that makes the best use of this wonderful world. It's the only book that could be read on its own too (although I highly recommend you read the previous books first) while at the same time setting the scene for the final book in the series. The Long Utopia is a triumph, it has the rich history of the Long Earth series but with a tightly focused story that manages to combine the voices of the two authors perfectly. It's like the first three books have been building the foundations for this moment and the result is mesmerising. Written on 21st July 2015 by Ant.